My baby boy is growing up. 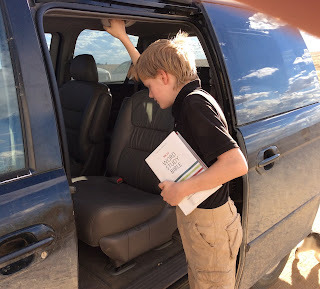 He decided that he needed a NKJV Bible, and it couldn't be one of these "for kids" or even "for teens" types of thing. He needed a serious Bible that treated him like an adult. I can't say no to that. So I showed him the NKJV Word Study Bible, from Thomas Nelson. He determined that would be perfect, and he was really interested in the idea of studying the Greek and Hebrew words. The words of Christ are in red. There are all these great translations of Greek and Hebrew words. There is an English word index in back, so I can find the words I want. He thinks this Bible is really great, and he really loves going through and reading the entries about the original words. He discovered today that there are also Aramaic words included, so he immediately went hunting to find those. The publisher's description included a couple more points than Richard's. My thoughts? If he gets tired of this particular Bible, I'd love to use it. I've always been a bit of an etymology enthusiast, and one thing I'm constantly doing in sermons or even just when reading the Bible is to be looking up the Greek or Hebrew and trying to figure out if things mean what the English words make me think they mean. Having the ability to do that easily within an actual physical Bible would be pretty amazing. I'm more excited about the fact that Richard is doing that though.